Easily migrate your static settings to dynamic settings. Admin interface to edit the dynamic settings. Here, 42 is the default value for the key THE_ANSWER if it is not found in the backend. The other member of the tuple is a help text the admin will show. 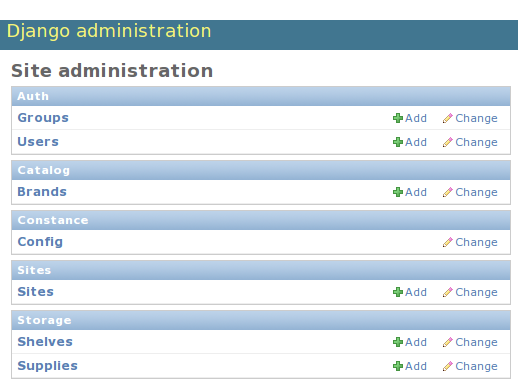 See the Backends section how to setup the backend and finish the configuration. django-constance’s hashes generated in different instances of the same application may differ, preventing data from being saved. Use this option in order to skip hash verification. Each time a value is changed it will trigger a config_updated signal. The sender is the config object, and the key and new_value are the ones just changed. This callback will get the config object as the first parameter so you can have an isolated function where you can access the config object without dealing with additional imports. You can set the field type with the third value in the CONSTANCE_CONFIG tuple. Custom field types are supported using the dictionary :setting:CONSTANCE_ADDITIONAL_FIELDS. This is a mapping between a field label and a sequence (list or tuple). The first item in the sequence is the string path of a field class, and the (optional) second item is a dictionary used to configure the field. Images are uploaded to MEDIA_ROOT. Constance can be used from your Python code and from your Django templates. For Django 1.8 and above, insert 'constance.context_processors.config' at the top of your TEMPLATES['OPTIONS']['context_processors'] list. See the Django documentation for details. This will add the config instance to the context of any template rendered with a RequestContext. Woohoo! Head over <a href="/sekrit/">here</a> to use the beta. to signup for our newletter. $ ./manage.py constance set SITE_NAME "Another Title"
If the value contains spaces it should be wrapped in quotes. CommandError: Enter a valid date. then the separate field values need to be provided as separate arguments. CommandError: Enter a list of values. Fire up your admin and you should see a new app called Constance with THE_ANSWER in the Config pseudo model. By default changing the settings via the admin is only allowed for super users. But in case you want to use the admin’s ability to implement custom authorization checks, feel free to set the CONSTANCE_SUPERUSER_ONLY setting to False and give the users or user groups access to the constance.change_config permission. The virtual application Constance among your regular applications. If you aim at creating a custom settings form this is possible in the following way: You can inherit from ConstanceAdmin and set the form property on your custom admin to use your custom form. 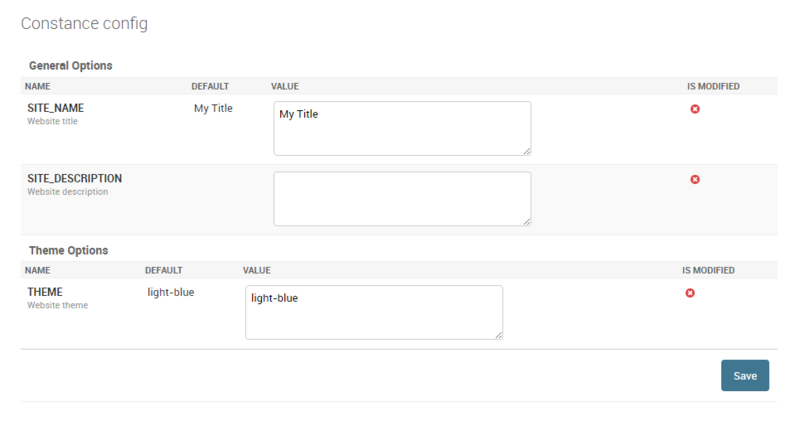 This allows you to define your own formsets and layouts, similar to defining a custom form on a standard Django ModelAdmin. This way you can fully style your settings form and group settings the way you like. Note that the default method returns self.change_list_form. © Copyright 2017, Jazzband Revision 2948dff3.